The Mobile Workshop Pavilion is a flexible system, which is able to adapt to different sites and users, to embrace it´s task to represent three different universities all over the world. The pavilion will be utilized mainly as a workshop space, where students can work together, but where they will exhibit their projects later on as well. 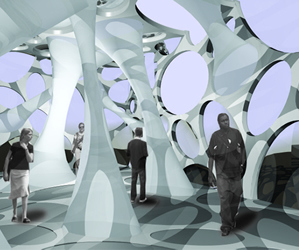 In addition to that a virtual pavilion was invented. This part of the concept can be an internet platform, where students from all over the world can meet to attend the running workshops of the physical pavilion or check out the latest developments in architecture or any other science. Furthermore users will be able to follow the journey of the pavilion around the world and they can gain information about different cities or countries where the physical building is errected. To unify the virtual and the physical world, visitors of the virtual “Mobile Workshop” are able to influence the physical building in various ways. The idea was, to point out to the physical visitors that there is a different kind of user through moving light points as well as through lighted interior installations and lighted translucent glass shells. The traffic of the internet platform is reflected by intensity and movement of the described light points.